*FMC Note: Farmers markets are renown for helping and bringing communities together in times of difficulty. Most recently, farmers markets nationwide offered support to federal employees impacted by the government shutdown. News sprung up from markets across the country including the Lewisburg Farmers Market in WV, the Corner Farmers Market in NC, the Northfield Farmers’ Market in VT, the Pearlridge Farmers Market in HI, and the Forsyth Farmers’ Market in GA, about their efforts to provide food to families struggling to make ends meet. Farmers markets also provide critical support to communities in the throes of rebuilding lives, businesses, and farms in the wake of natural disaster. In this post by FMC member Cindy Bunch, Executive Market Manager of Olde Beaufort Farmers’ Market, she recounts the recent devastation wrought by Hurricane Florence, and how her market came to the aid of the community went it needed it most. On September 14, 2018, after hours of extremely strong wind and rain pummeling Carteret County, NC, Hurricane Florence made landfall. Due to its slow forward speed, the huge amount of rainfall it released, the powerful storm surge, and the accompanying hurricane force winds in the northeast quadrant of the storm, the damage to our area was tremendous – exceptional actually – in the history of our hurricane-prone county. Almost everyone suffered some sort of loss. As one might imagine, this event had a major impact on many vendors in the Olde Beaufort Farmers’ Market. Farmers’ crops were flooded, badly wind beaten, and some farmers lost livestock in the flooding. Artisans lost their studios due to roof damage, and almost all vendors were impacted in some way. Even the fishermen were unable to return to the waters for weeks due to pollution from runoff and the turbulence of the seas. The devastation was unbelievable, the worst that many of us who had lived here more than 30 years had ever experienced or seen. As the piles of wet carpet, water-damaged furniture, and wet sheetrock appeared along the roadsides, and blue tarps covered the roofs of many homes, the realization of the extent of the damage the county had suffered became evident. Folks organized work parties to help their neighbors, spent long hours cleaning up debris, and lived without electricity for days. While residents took a collective deep breath and went to work, the weeks dragged on, and a palpable sense of anxiety and sadness emerged. 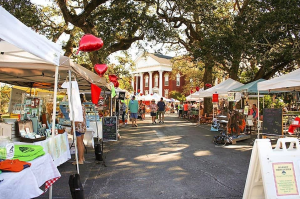 The farmers’ market was cancelled the two Saturdays immediately following the storm but on the third Saturday, vendors regathered on our courthouse grounds, the current market’s home for the past 6 years, and the original home of the market during colonial days. The mood was quiet and subdued, as compared to the usually energetic morning markets, but folks were glad to take this step to getting life back to normal. Vendor numbers, shopper numbers, and sales were low, but the reward was in the community coming together to share storm stories, to check on each other, and to show support and caring. Slowly, over the course of the next several markets, vendors and shoppers returned, although some farmers had lost not only their crops, but also their desire to move forward. In response to this need, the OBFM gave farmers four free dates at the market when they were able to return in a show of appreciation, and as an incentive to encourage them to regroup, to replant, and to return. Frank’s Franks serves up free hot food to folks at OBFM. The OBFM organization had planned an outdoor, fine dining dinner for the first week in October, but at its September board meeting, the decision was made to cancel this fundraiser and to feed folks at no charge at the market each Saturday morning through the month of October instead. In collaboration with one of our food vendors, Frank’s Franks, they did the cooking while the OBFM, along with donations from appreciative diners and several businesses who wanted to be a part of this effort, handled the cost. 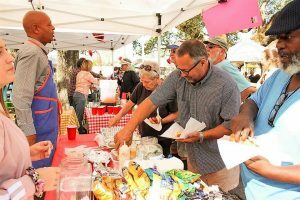 Citizens who had never been to the farmers’ market showed up in large numbers, traumatized, tired, hungry, and in true disbelief that they could enjoy a hot meal at no cost, listen to music from a local band, and share in the community bonding that filled the marketplace. Over the course of five Saturdays the market fed close to 3,000 meals to people in our community. Also in response to the hurricane recovery efforts, the market hosted community, state, and a federal organization to provide resources for the citizens. FEMA representatives worked to help folks fill out applications for assistance, the Carteret County Health Department provided info on how to decontaminate wells to make drinking water safe, local clinics did health checks and talked with folks about their physical and mental health needs during this time of extreme stress, and a list of available housing was shared with those who had been displaced by the damage to their homes. 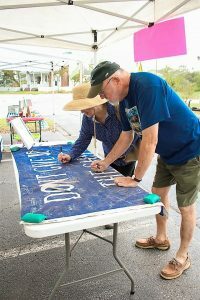 Shoppers sign “Don’t Give Up the Ship” flag at OBFM. The market became a hub of recovery resources and a place of caring for everyone. A mud covered flag emblazoned with the slogan, “Don’t Give Up the Ship” that a tired and dirty volunteer found washed up on the shore of a local creek became a symbol around which market folks rallied by signing their names and writing sentiments across its stained blue surface. While Carteret County has not yet returned to its pre-Florence state, folks are rebuilding, blue tarps are slowly disappearing, and the spirit of our hardy coastal residents has come back strong. The market leadership is happy to have been able to help in this effort and looks forward to continuing to be responsive to the needs of our community in the future. We learned from this experience that the OBFM is more than an outdoor farmers’ market; it is an anchor for our community that reaches back nearly 300 years.